Today we’re going to look at the Active vs Passive investing debate, and the wider implications of index funds. We’ll also touch on diversification. The idea for this article came from a discussion on Stockopedia about an article posted back in October.1 Some of the articles that the comments linked to got me thinking about where I stand in the old active vs passive debate. 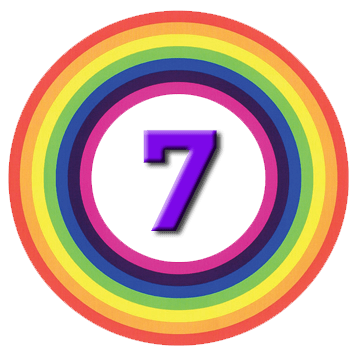 value, small-cap, momentum, dividends etc. Which is best, active or passive? Are index funds a good thing, or are they dangerous? What is the best way to index? 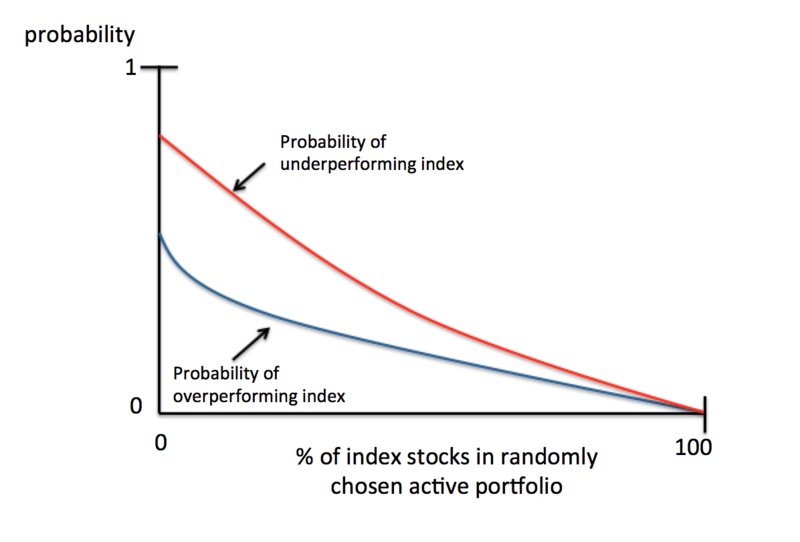 If you go active, how big a portfolio do you need to be safe? Index funds and passive investing are not new – the first fund was created by Vanguard in 1976 – but they have become much more popular since the 2008 crisis. According to some observers, index funds now hold a third of of the total assets of stock funds, up from less than 20% a decade ago. Others put the figure as low as 10%. There’s actually some debate about the passive out-performance. If the larger, more popular active funds had better returns, real-world active investors might still do better than passive ones. But then you would also have to factor in the average investor’s timing decisions – when to buy and sell, These have been separately shown to knock around 3% pa off average returns. Ed Croft, the CEO of Stockopedia, thinks that index funds are parasites. Since he sells (rents out) a stock data and ranking system, he has an incentive to say that, but it’s worth looking at his reasons. Ed says that index investing is a “piggyback ride on the coat-tails of the active management community”. This is because stocks are included in (“promoted” to) the key indices because they are bid up by active investors. When a stock is added to an index, the passive funds then have to buy, pushing the price up further. Ed says that the initial bump is 9% for the S&P 500, and the overall price premium to non-members eventually reaches 40%. So this is not really a passive strategy, in the sense of it being market neutral. It’s more like a large-cap growth and momentum strategy. It’s also a long way from the goal of a public stock-market, which is to direct capital towards the most efficient users of it. As valuations become ever-more stretched for the market leaders, future returns must either dwindle, or continue to inflate a bubble waiting to pop. The larger the proportion of the market that is owned by index funds, the worse this problem becomes. Overvalued stocks will fall harder in a correction. In October 1987 stocks in the big indexes dropped 7 percent more than non-index stocks. Correlations between stocks are increasing, and some people put this down to the rise in index funds. I think that at least part of the rise over the past 8 years is due to markets responding to macro behaviour – in particular central-bank statements and actions – in the wake of the credit crunch. For passive investors, the technique’s increasing popularity is a problem. The more it dominates, the less likely it is to outperform. If passive investing came to dominate the market, it would be easy to exploit. If an investor bought shares in a company (beyond its index weight), he would push the price up, raising its weight in the index. Other passive investors would then have to buy that stock to match its new weighting, pushing the price even higher. The original investor could then sell those shares at a profit – pushing their price back down – and repeat the trick with another index stock. So passive investing could never truly dominate, though it could eventually lead to high volatility and almost random pricing. But this in turn might drive people from the market, reducing liquidity. One serious flaw with current index funds are mostly large-cap biased, and market-cap weighted. 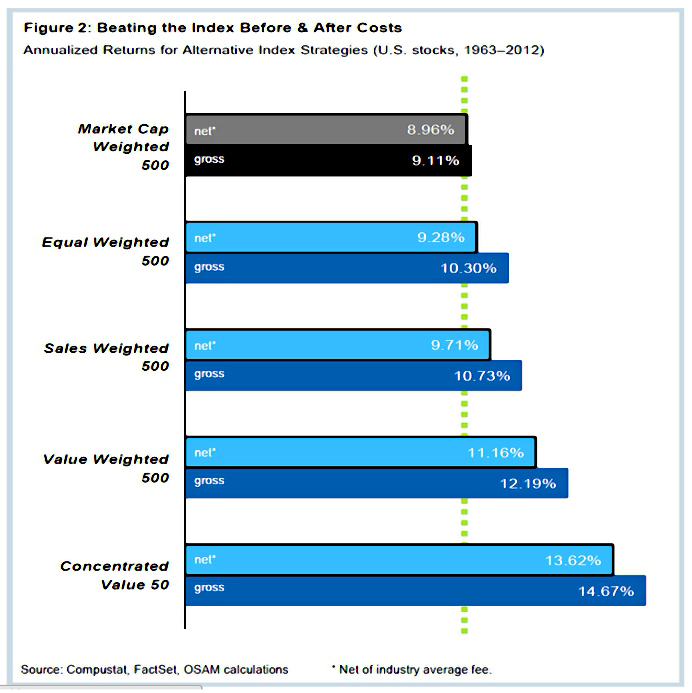 Cap-weighted indexes, by definition, give a greater weight to companies with high valuations. Overvalued companies will punch above their weight, while undervalued companies have little influence. Here in the UK we have the further problem that the FTSE-100 is dominated by energy and resources stocks, plus financials. Widening your scope to the FTSE-All Share makes little difference in a market-cap weighted fund since so much of the market cap is still provided by the biggest 100 stocks. 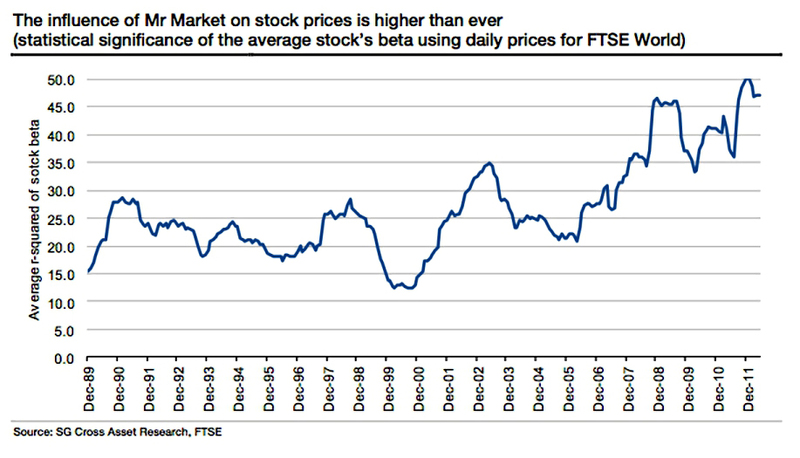 Using a FTSE-250 index fund (if you can find one) alongside a FTSE-100 one would be a better approach. We have a different problem at the bottom end of the market. AIM is riddled with terrible companies, and the AIM index routinely loses money. Yet there are dozens of good and profitable companies listed on the market, and lots of stocks make good returns each year. This is definitely an area where active management pays off. The same is probably true for illiquid and poorly governed markets, like emerging and frontier markets, where active managers may be able to leverage an information advantage. A better option for indices would be to use equal-weightings. This is an approach used by many active investors in their portfolios. Alpha Architect looked at index weightings in detail. They compared equal-weight (EW), to momentum weight (MW) to low volatility weight to value-weight (market cap weight, VW) for the 250 largest firms in the US. The small sample size was chosen to allow the study to go back to the 1920s, when there were fewer listed firms. Returns from the top 250 stocks each month were 99.5% correlated with S&P 500 returns. Low volatility worked the best on a risk-adjusted basis over 87 years, but all results were similar. Value-weighting (market cap) came last. Volatility weighting has the highest Sharpe and Sortino Ratio in all periods and has the highest risk-adjusted returns. 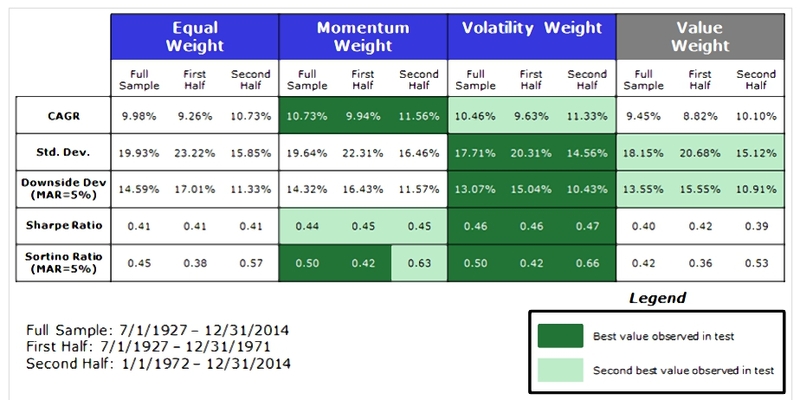 Momentum weighting has the highest CAGR in all periods, but follows volatility weighting on a risk-adjusted basis. Equal weighting works better than the value weight index, but the effect is marginal. Another alternative is to use fundamental or even technical factors to choose the stocks. This is factor investing or smart beta, which we will cover in a separate article. Fundamental indexing began more than a decade ago in the US, but there aren’t many of these funds in the UK at present. US funds weight on book value, total sales, cash flow and dividends, but they are much more expensive than standard index-tracking ETFs. An alternative explanation for active fund underperformance is the idea that the returns on stocks are highly varied. Any active portfolio which doesn’t include enough of these super-stocks will underperform the index. A small, concentrated “conviction” portfolio will have the best chance of beating the index but also the greatest chance of underperforming (if randomly selected – we all hope than a great asset manager can overcome this disadvantage). An article on Bloomberg illustrates the idea. They used an index made up of just five stocks. Four will return 10% and one will return 50%. If they make up portfolios of one or two stocks, equally weighted, only 5 of the 15 possible portfolios will include the 50% stock and outperform. Ignoring fund costs, the average active return will be the same as the index (18%) but two-thirds of the active portfolios will under-perform. The flip side of this is that if you can identify the best active managers, they have a good chance of out-performing. It also means that a private investor can out-perform, if he can identify a few of the big winners. Bernstein thinks all this is misleading. The key risk is not volatility but “Terminal Wealth Dispersion” (TWD) – lots of 30-stock portfolios will still produce poor returns. Bernstein quotes Ed O’Neal’s finding that TWD reduces with the square root of the number of stocks – so 4 stocks are half as risky as one. This means a 30 stock portfolio would have 18% of the TWD risk of one stock. Not too bad from my perspective. Bernstein looked at the S&P 500 as at December 1999 and formed 98 random equally weighted 15 stock portfolios, hypothetically held for the previous 10 years. Portfolios without these stocks lagged the market. Bernstein concluded that not even 100 stocks could eliminate TWD risk. The only way to minimize the risks was to own the whole market. 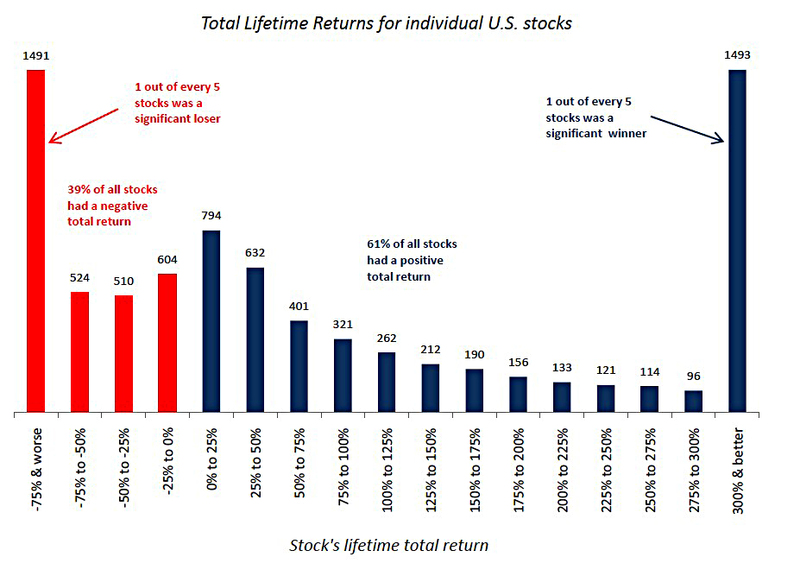 An article on ValueWalk takes this idea of a few big winners a bit further, and suggests that there is a Capitalism Distribution for life-time returns on stocks. They looked at all the stocks that traded on the NYSE, AMEX, and NASDAQ 1983, including delisted stocks. They used a filter to refine this universe to the 8,054 stocks that would have qualified for the Russell 3000 at some point in their lifetime. The second chart shows the compounded annual return relative to the index. 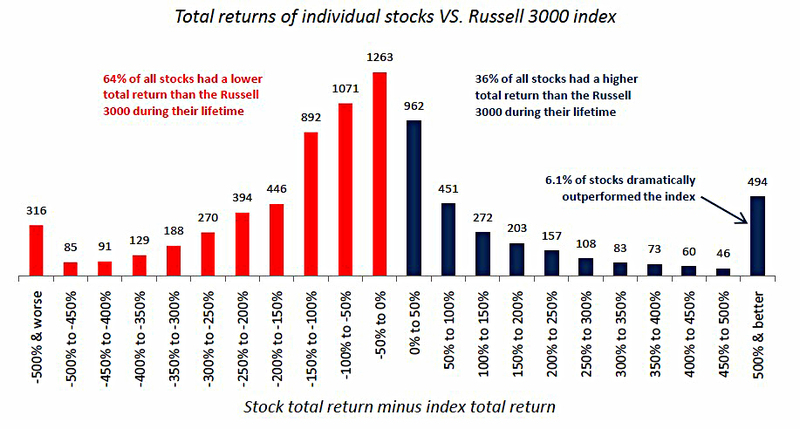 1,498 (18.6% of all) stocks dramatically under-performed the Russell 3000 during their lifetime. 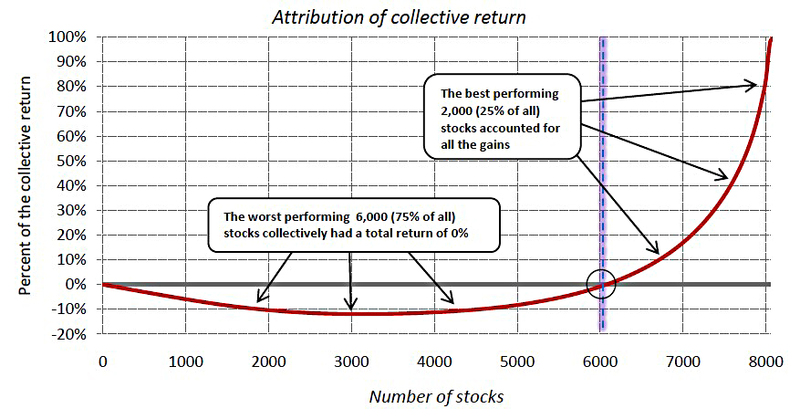 The fourth chart shows the cumulative distribution of the stock returns. 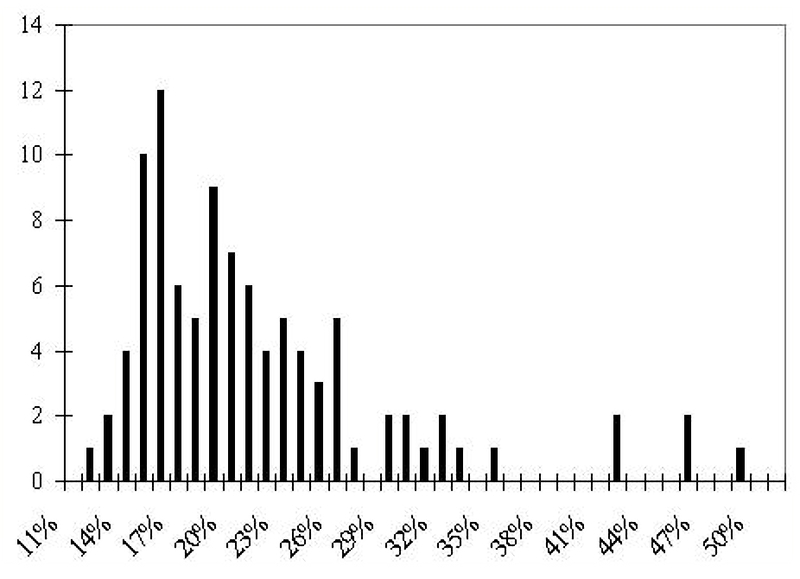 The last chart shows the contribution of the stocks (in profitability order) to the overall returns. 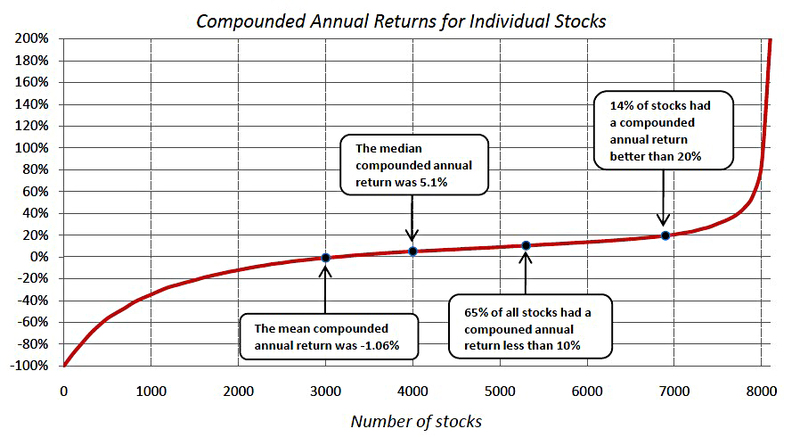 Avoiding the best 25% of stocks would have led to zero returns. 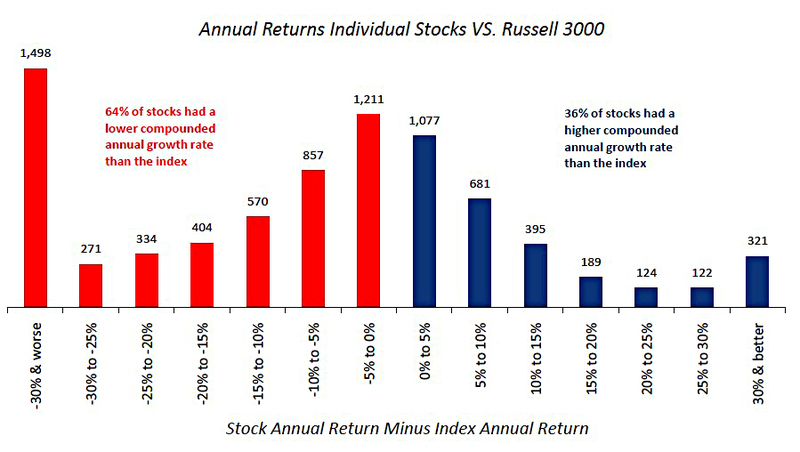 Once again, it seems that the majority of returns come from a minority of stocks. I plan to keep using a mix of passive and active strategies.